Welcome back to our series The Tao of Cash Flow: How To Master Your Business Finances. In the series so far, we have looked at what cash flow is & why it is important, how to do a cash flow forecast, how to keep track of who owes you money, how to ensure customers pay on time and how to minimise your business expenses. In this post, we will be considering how to create a business budget so that we can plan our spending in a more strategic and effective way. Just as it is very important to maintain a budget for your spending in your personal life, so it is also vital that you have a budget for your business too. A budget is an estimate of your income and spending over a period of time. It is quite similar to the cash flow forecast we did in an earlier blog, however, this time we are looking specifically at how much profit we want to make and how much we can afford to spend. A budget is essentially a financial plan for your business. Creating a budget involves two parts – creating an annual budget and a monthly budget. The annual budget sets out what you think you will spend over the twelve month period. The monthly one will be useful for checking how you are performing against what you originally planned. But before we get into that, let’s look at why having a budget is so important. So why is it important? There are many reasons why you should be creating a budget. First, it allows you to plan better. It is like having a map for your business – showing you where you are going and how you are going to get there. You can gain a long-term view of your business activities, see reliable estimates for how much profit you will be making and when, and allows you to anticipate future needs or problems. You can also see what you need to be making in sales and spending, in order to meet your business goals. Second, It allows you to evaluate how the business is performing over time. You can see whether you are making the sales you expected each month, whether you are keeping costs under control, and why there are any differences to what you expected. Third, It helps you to see where you can cut costs because you can see how much you are spending each month on particular areas of your business. Armed with this information, you can identify and then cut out any wasteful or unnecessary spending. Having a budget that shows you what you were expecting to spend, and then what you actually spent can be very enlightening. In fact, the budget should guide every decision on business expenditure during the year. Fourth, it will let you spot problems quickly so you can make adjustments. If you do your monthly figures and find that they were way out from your estimates, you can easily see why you there was a big difference and make adjustments for the future. Fifth, it will help you gain investment (or make investment decisions). Banks and other lenders will expect to see your business budget before they give you any finances, to see that you are likely to be able to pay it back. Similarly, by seeing how much profit you are making, you can make decisions on whether you can afford to invest in new equipment, vehicles, offices e.t.c. Sixth, you can carry out “what if” scenarios. With a budget on a spreadsheet, it’s very easy and simple to change a few numbers to see what would happen to finances over the month or year. For example, you could test a scenario where you increase sales by 10% and see how that affects your profit outcome. Or you could test a scenario where you invest some money in a new website and see how that affects the figures. Finally, and most importantly, a budget will tell you what you can pay yourself. The profit you make as a small business is what allows you to make an income for yourself, but if you don’t know what that profit is each month, how can you decide how much to pay yourself? Let’s start by learning a few simple terms. Fixed Costs – these are costs that are “fixed” and stay the same regardless of how much you sell. For example, your cost of rent, insurance, internet, business loans and so on. Variable Costs – unsurprisingly, these costs are “variable”, in other words, they vary based on how much you sell. So you might buy some sports kit to sell to customers – you only need to buy the amount you need for the customers you have, so this cost will vary based on how many of the kits you need. Semi-Variable Costs – these costs have a mixture of fixed and variable elements. There may be a cost such as a phone bill, where there is a charge for line rental and then an extra amount based on the number of phone calls you make. Let’s go through the process of creating the budget. First, please go back to your cash flow forecast that we created in an earlier post as that contains a lot of the figures you need. If you haven’t yet created it…..now is the time. 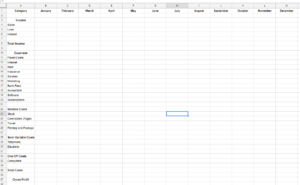 Step 1: Set Up The First Spreadsheet. Next, please open up a spreadsheet. Both Excel and Google Sheets are suitable. Once it is opened, please look at the bottom of the screen to find the button saying “sheet1”. I have included a picture below. Next to the Sheet is a ‘+’ button. Keep this in mind as we will be creating multiple sheets this time. Now, let’s go back up to the top of the page. There are three things that need to be shown on a budget – the income, the expenses and the profit. At the top, you are going to want to create a column for “category” followed by columns for each month of the year. In the first column, you are going to want to create different sections. The first is for “Income”, and next is “Expenses”, which you need to split into Fixed, Variable and possibly Semi-Variable Costs. You may also want to include a section for “one-off spends” such as new furniture or computers. Don’t forget to also include rows for total income and total expenses. You will also need a final row for the “Gross Profit”. This is your income minus your expenses. Please see the image below. I’m going to assume that you have already got together your figures from the cash flow forecast so they can simply be transferred across. If you haven’t, please read that article for tips on how to collect the figures together. And don’t forget to be conservative in your estimations. Underestimate your sales and overestimate your costs in order to keep things as reliable as possible. Make sure you ask other franchisees and your franchisor for advice on costs and likely numbers of sales. If you’ve been established in business for a while, you can use previous month’s figures (look at your bank statements), but don’t forget to consider the effects of the economy (is a downturn likely?) as well as seasonality. Don’t worry too much about getting these figures wrong though – They really are just estimates. When it comes to sales, if you have a set of customers who are paying a recurring amount on a monthly basis, it should be fairly easy to find figures by simply adding up the number of customers who are paying monthly and multiplying that by the amount they pay. However, you are probably going to gain or lose some customers each month so take that into account, and also remember that not everyone pays on time so you might need to reduce your figures slightly to take into account bad debts (where people don’t pay) and late payers. If you are using an accounting software such as Quickbooks, you can use the “Profit and Loss” report under the Reporting tab, to see what you are making in sales and what you are spending out in expenses. These figures can then be added to the report. 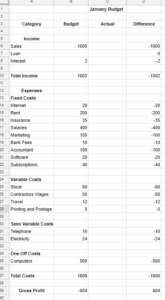 Once you have filled in the figures on the spreadsheet, don’t forget to add in the formulae to do the mathematical calculations for you in the total income, total expenses, and gross profit rows. The formulae will be along the lines of “=sum(B23:B30)” or “=sum(B22-B11)”. You gross profit row should be your total income minus your total costs. Hopefully, your spreadsheet now looks something like the image above. Step 3 – Creating a Monthly Budget. Now you have an annual budget, it’s time to create the monthly one. 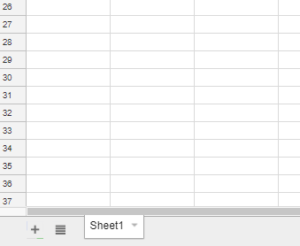 If you go back down to the bottom of the page, to the “sheet1” tab and click the ‘+’ sign, it should open up a brand new tab. You can rename the new tab as “January” (or whichever month you want to start at). In this new tab, we are going to copy across the first column from your annual budget sheet. So your first column will be called “Category” and again it will be split up into income, expenses and gross profit. This time, instead of a column for each month, you need just three columns. Please title these three columns as “Budget”, “Actual” and “Difference”. It would also be a good idea to add in the formulae for the “difference” column. The formulae should look like “=sum(c6-b6). Using the information you had in the annual report, just copy the figures across into the “budget” column. You should now be left with one empty column – the “actual” column. This is the column you will fill in at the end of each month with the actual figures that you made or spent. In addition to filling in the actual figures each month, you may need to go back and revise your annual budget figures to make sure they reflect reality. Finally, repeat steps three and four for each of the months. So you should end up with 13 “sheets” or tabs – the annual budget one and one for each monthly budget. Before we finish, here are just a few tips. First, if you need any help, please don’t hesitate to ask us for help with this if you need it. 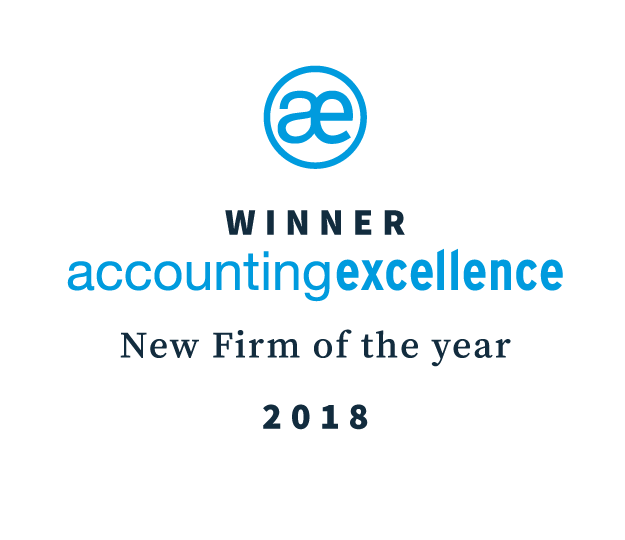 That’s part of what an accountant is here for. Secondly, make sure you are reviewing your budget monthly in one of your weekly times set aside for dealing with the financial side of your business (as we have suggested in previous posts).